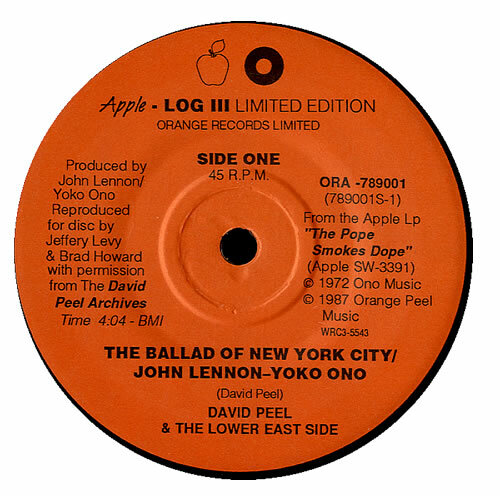 DAVID PEEL & THE LOWER EAST SIDE/JOHN & YOKO The Ballad Of New York City (Rare 1987 US Orange label limited edition 'Apple - Log III' 2-track 7" vinyl single featuring a cut from the 1972 'Pope Smokes Dope' album plus This Is Not Here - an interview with John and Yoko recorded at the Everson Museum, Syracuse, New York on October 8th 1971 during the private view for Yoko's art exibition, housed in a picture sleeve. 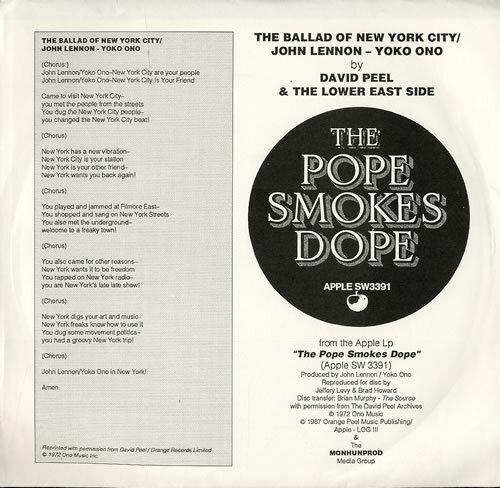 The vinyl has just a couple of light inaudible surface marks, the labels are free of spindle marks and the sleeve is in near mint condition. A fantastic copy of this rarity! ORA-789001).